Wait until they find that list of unannounced random games I posted later. 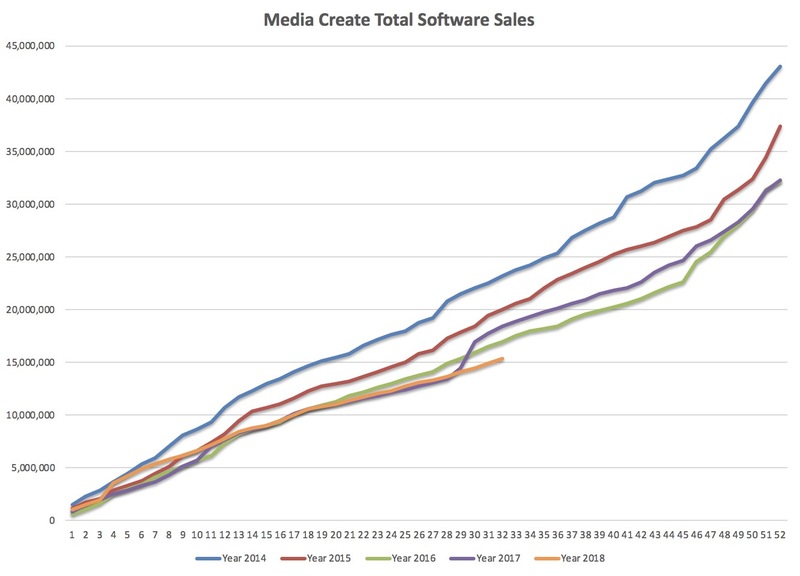 Next week should be the first of many weeks where Switch software starts to conisderably outperform 2012 software sales. My Hero Academia is pretty much going to be the only new game launched this month on the Switch that could end up with over >75K sales but evergreen software performance continues to be the main driver behind Switch's ability to keep up with 3DS. 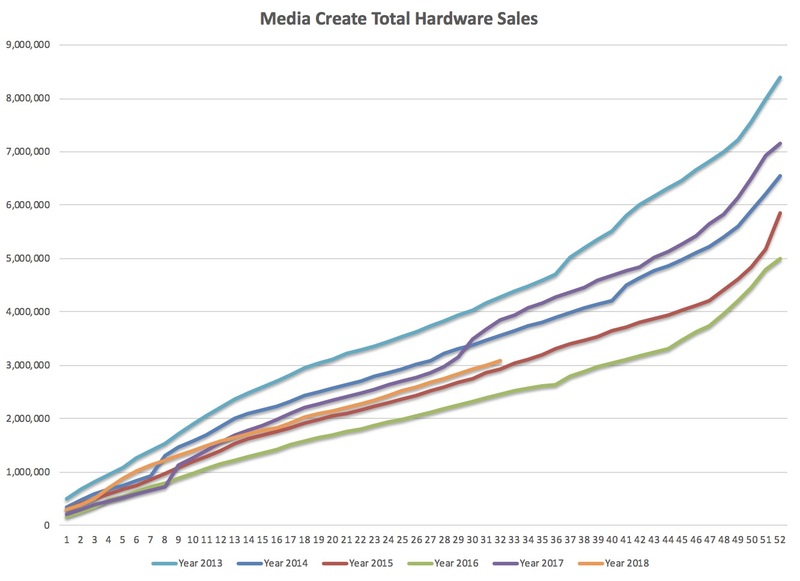 September looks potentially much stronger for the Switch compared to the 3DS in 2012, back than the 3DS didn't have a single game launching with over 100K sales. In 2012 during September the biggest game launch was Style Savvy: Trendsetters which ended up with 250K for 2012. The other games to break 100K in 2012 were Devil Summoner: Soul Hackers & Medarot 7. This September Labo Drive Kit I expect to open with over 150K and have much stronger legs than Variety Kit. Dragon Ball FighterZ, FIFA 19, Valkyria Chronicles 4 & XC2 Torna: The Golden Country are all games which could potentially sell over 100K in 2018 - FIFA 19 in particular should see strong growth for it's launch. While October had just one major title in the form of Bravely Default: Flying Fairy - this year Switch will have a ton more titles launch that could do very well. Super Mario Party should very easily finish the year with over >750K sales. I'd expect the game to sell over >300K in it's launch month alone. I have a feeling a lot of the October titles that will be launched aren't announced yet, but out of the titles we know I still feel that Dark Souls is going to sell over >100K on the Switch despite the huge delay. 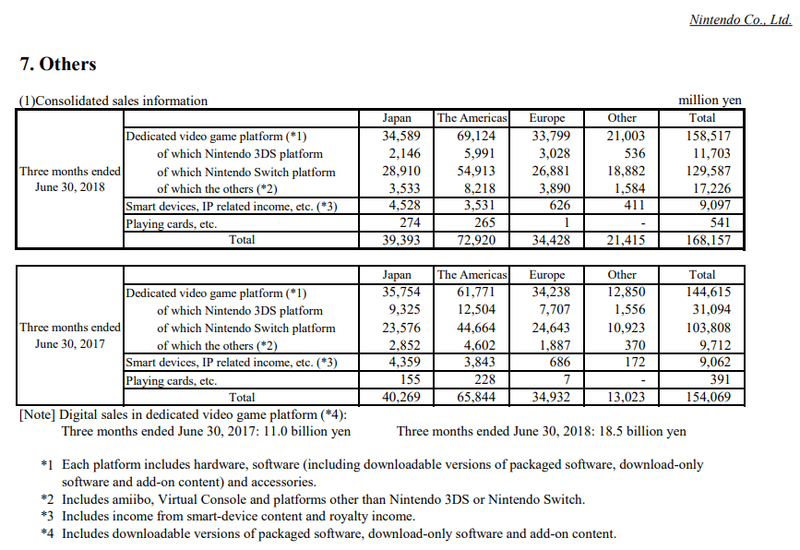 I finally got a chance to look at Nintendo's financials for the quarter and it looks 3DS is collapsing faster than I thought. From 20% share last year it fell to 7% and it will go even lower when FY ends. With how almost everything software related underperforms lately Luigi's Mansion will be in very tough position if it follows the general trend. Pokemon and catalog titles keep it still kinda alive at charts. The 3DS software market seems to have dropped much faster in Japan than elsewhere. 6th week with Octopath Traveler out of stock. And still more than 2 weeks left. I was sorting my Famtisu data against yours, I must have missed the first half of 2018 chart. The only thing I found wrong in yours was the Joy Con Variety set is a little out of date by a few weeks. A big part of western 3DS software sales comes from bundles and Nintendo Select line. With the exception of Pokemon, that saw a resurrection after Pokemon Go, the market it covers anymore is that of cheap gifts for kids. Very few full priced releases last year found an audience and things are even worse in 2018. Japan is saturated since it's maybe the only big market in the planet 3DS was a real player and it's expected to go down faster but even then since it's not seen as the cheap alternative console the situation for new games remains better. Don't be surprised that for many releases since late last year Japanese sales are a very big percentage of worldwide. Nintendo going for dual releases with Switch wherever possible lately has improved things but for the remaining games that will be 3DS exclusives they already know what is coming. If you think WarioWare Gold underperformed in Japan you don't want to know its sales overseas. A big part of western 3DS software sales comes from bundles and Nintendo Select line. With the exception of Pokemon, that saw a resurrection after Pokemon Go effect, the market it covers anymore is that of cheap gifts for kids. Very few full priced releases last year found an audience and things are even worse in 2018. Japan is saturated since it's maybe the only big market in the planet 3DS was a real player and it's expected to go down faster but even then since it's not seen as the cheap alternative console the situation for new games remains better. Don't be surprised that for many releases since late last year Japanese sales are a very big percentage of worldwide. There aren't many things that can be done for Luigi's Mansion and Mario & Luigi 3. The engine for a Luigi's Mansion remaster doesn't exist and the other is built with 3DS touch screen in mind. Nintendo pretended 3DS doesn't exist at E3, they will date the first for holidays and the second for as soon as possible in 2019 and wait for the best. I think those are all fairly safe predictions. I'm curious to see how Tales of Vesperia will perform on Switch. It will be releasing on PS4 and Xbox as well so I'm not expecting massive sales. Especially since the Tales fanbase is historically stronger on Playstation. However, I could see it at 50-100k first week with a 100k+ sold by the end of the year. This also isnt counting if any potential rumored games pan out. An NSMBU port would be a massive seller. Also I could see a 4th Labo project in November that would likely sell 150k+ depending on the concept. With each labo release, I think it's likely that it will also boost the sales of the other packs. I'm curious to see how 2018 evergreen software will perform during the holidays such as Kirby, DK, Captain Toad, Mario Tennis, Taiko, Octopath Traveller, and the Labo projects. Does it really matter? The development costs on both of these should be relatively low and still open the door for future ports at some point way down in the future. It doesn't matter from the moment Switch covers the loses. If Switch wasn't exceeding expectations the missing 3DS forecast would matter a lot. Literally always too optimistic. Fifa and Dragon Ball FighterZ should both break 100k with legs. No way in hell does the Drive Kit get more than 100k OW, let alone 150k. I doubt VC4 or Xenoblade DLC break 100k. Definately agree with VC4.. but Xenoblade is a bit more tricky imo. Calling it DLC when it's a standalone game is a bit misleading and it's also a Nintendo product which by itself adds sales.. I wouldnt count it out hitting 100k even though I'm probably with you here..
Lower than last year but still over 2016 and 2015. 2018 software has good chances to end over 2016 and 2017 or very close to them but everything depends on Switch and basically Pokemon performance. Are digitally sales counted on those graphs? Because those are always growing. They don't but rising digital can't cover at best more than a 5-10% drop YOY with PS4 and Switch as the main consoles. No way in hell Drive Kit gets more than 100K OW? Variety alone managed close to 100K. In terms of VC4, I think it could OW of around 30K - 40K and end up with over >70K sales before it disappears from the the chart. A lot of Switch software that isn't charting is still doing decent numbers. For example Bomberman R sold 91K by June on Famitsu but ended up with 120K in 2017. When Famitsu releases the Top 100 for the year I won't be surprised to see several smaller Switch titles end up doing 25K - 50K while not charting(Snack World, DQB, AOT2, Skyrim). While titles like DKTF, Mario+Rabbids end up easily over 300K despite not charting during the tail end of the year. While for Xenoblade DLC is a standalone game that's less expensive and there might be some who jump in due to the pricing difference - Xenoblade 2 is selling for ￥7.389 while Standalone DLC is ￥3,701 on Amazon. That's a pretty considerable difference in price which makes me believe that a lot of people who might otherwise be on the fence will jump in. Yes. The Variety Kit has the broadest appeal of any Labo, and it didn’t hit 100k and this Drive Kit will not have that new game appeal. It will only sell to those that really enjoyed the first round of Labo. A game that you can't preorder less than 4 weeks from release isn't opening at 100k. Level of promotion for 03 is way below 01 and 02. Sad sight. There haven't been many heavy hitters from third-party publishers this year. I hope that will change next year (hopefully we'll get some announcements in the Road to TGS). 2018 also has been a transitional year from PS4+PSV to PS4-only or PS4+NSW. In combination with a stronger third-party line-up, hopefully that will positively influence the results next year. I doubt we'll get a recovery on the software front for 2018.
chris already talked about it but LM is using the engine made for 3ds. and BiS was made with 2 screens in mind and a touch screen. It is true, however 2018 is heavily biased toward Q4. Things could go really go crazy this Q4 so I wouldnt dismiss it just yet. Aside from Nintendo's first-party games, which games do we expect to be significant sellers? On PS4, FIFA 19, Winning Eleven 2019, Sen no Kiseki IV, Musou Orochi 3 (at least combined), Red Dead Redemption, Battlefield V, Call of Duty: Black Ops IIII will reach 100k+ for sure. I have no clue about Spider-Man and Utawarerumono Zan. And then there's sub-100k stuff like Assassin's Creed Odyssey and perhaps some Bandai Namco stuff like Naruto to Boruto (I have no idea what to expect), but that's about it. Destiny 2 sold okay, but the expansions of Destiny 1 were non-events in Japan. On Switch, we have the obvious first-party stuff: Super Mario Party, Pokémon LGPE and Smash Special. Aside from that, there's Youkai Watch 4 and Inazuma Eleven Ares, but there's not much else. Maybe Dragon Quest Builders 2 will release this year, but I don't expect it. Of course the Switch's evergreen titles will continue to sell. We're at 15M software units sold now, which is ~2M behind 2016 and ~4M behind 2017. The gap can still be filled, but the entire year relies on that Switch Quartet (three first-party games + Youkai Watch 4) and back catalogue. In Japan? When? Unless you're counting Tales of Phantasia on Snes... (and no, Symphonia was not stronger on Nintendo systems in Japan). Ahhhh ok, no worries then. I'd wait for the entire Q4 schedule to be revealed first before going for comparisons. Even with only the current known releases this could be the biggest since 2014. Symphonia on GC is still unmatched in the west sales-wise for the series IIRC, and DOTNW did about the same as Vesperia in the west as well I believe. Nani!? Damn you new releases (except for BGP) for making Better Tracker's 1.5+2.5 not appear in the chart and finally breaking the streak. Road to 200k for Superior Tracker: 192k. is it possible that SE is prioritizing their USA OT production over the Japanese one, since the game is also selling well in MURICA (the best selling game in july according to NPD leaks)? Maybe they know that people will buy OT in Japan even if it takes a little longer, but in the west they are afraid that, after the initial hype, the demand will be much lower, since jrpgs are no longer mainstream. Wouldn’t they be separate? Like NoA, NoE and Japan. Unless all the carts are produced in one place. i dont know. the lack of SE's capacity to supply the demand for this game is so absurd that I think anything is possible. Nintendo is publishing the game outside of Japan, not SE. Isn't the opposite true? Due to the strong second hand market you're more likely to lose sales in Japan. That plus the west tends to be more open to buying games digitally as well. The western copies are not being produced in Japan and shipped elsewhere. NA carts are produced in a factory in the US. Probably the biggest cause of delay here is due to obon and people taking their summer vacations. Really? Because in Europe they write imported from Kyoto and in the states they writte made in Japan. Isnt that referring to the game itself(the code) rather than the cardrige ? Unless Nintendo changed their distribution/production system with the Switch, all game carts are made in Japan without exception, though the whole thing is assembled (basically, cart put in box, etc.) in Germany for Europe. Nothing should be made outside Japan, except the cardboard sheets for Nintendo Labo (which are all done in their respective regions). Nope. All games carts are made in Japan, no exception. Many stores received EOX 3ds today, low quantities. Makes sense to have your worst week for stock to be during Obon. Well played SE.